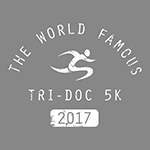 AUSTIN, Texas, August 7, 2017 — On Sunday, August 6th, nearly 700 people participated in the 15th Annual Jack’s Generic Triathlon (JGT) at Lake Pflugerville – near Austin, Texas. Participants, including Amy Marsh, 4x IRONMAN Champion and Acute Myeloid Leukemia survivor, competed against themselves, a steady wind, and the rest of the field to accomplish personal bests, earn awards, complete their first triathlon, or overcome personal challenges. An exclamation point was placed on the 15th Anniversary of Jack’s Generic Tri as the Austin endurance community came together to celebrate the return of one of their own, Laurie Allen. Allen, who has quadriplegia stemming from a February 2015 accident, finished a modified version of the sprint course in 2:00:00. Allen is a 9-time IRONMAN finisher and 9-time IRONMAN 70.3 finisher. Paul “Barny” Williams took the overall victory with the time of 1:53:18. Second and third place went to Antonio Ferreira Da Silva Neto and Brendan Loehr, who crossed the finish line in 1:56:01 and 1:58:13 respectively. The women’s podium was topped by Natasha Van Der Merwe who had a winning time of 2:07:15. Second place finisher Des Berry (2:09:57) and third place finisher Fernanda Bau (2:10:24) rounded out the women’s field. Austinites Adrian Cameron (1:00:21) and Margaret Finley (1:04:40) were the male and female sprint champs. Participants received 15th Anniversary shirts and reusable bags, glow-in-the-dark water bottles, swim caps, beer, finisher’s medal, post-race food, and the signature swag toss. Professional timing, a wonderful volunteer crew, hundreds of supportive spectators, and an electric finish line festival made the 15th Anniversary of Jack’s Generic Triathlon special. The athletes completed sprint (500m swim, 12.9 mile bike, 3 mile run), intermediate (1000m swim, 25.8 mile bike, 6 mile run), and aquabike (1000m swim, 25.8 mile bike) distances and enjoyed one of the best post-race parties in Central Texas. The High Five Events crew spent the better part of race week removing much of the disliked hydrilla that is known to overtake Lake Pflugerville. Jack’s Generic Tri would like to thank all of the volunteers for coming out and making yesterday’s event memorable. Their willingness to arrive extra early, lend their time and energy, and cheer on every participant truly made the 15th anniversary unforgettable. JGT would also like to thank sponsors Medicine in Motion, Clif Bar, The Shade Project, Third Base Sports, and Ben Phillips, Real Estate Advisor for Engel and Volkers Austin. Jack’s Generic Triathlon participants can see their times here.